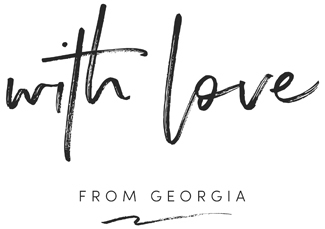 With Love From Georgia: Gift Guide for YOU! 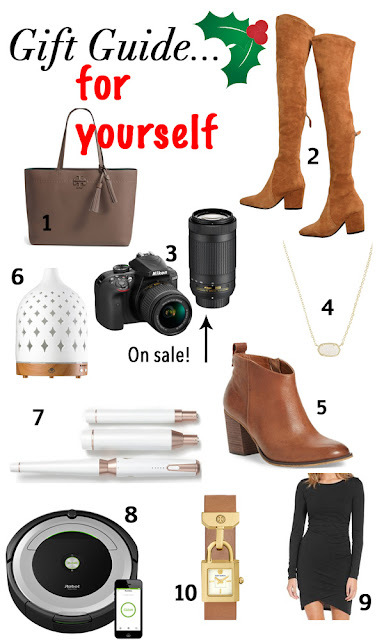 I've seen so many gift guides with the upcoming holiday season, and they're all so good! Something that has been missing from the blog universe though, is a gift guide for yourself! Don't get me wrong, giving gifts is my absolute favorite thing ever. There's just something about putting a smile on someone's face, and gifting something that they wouldn't have otherwise bought themselves. However, we work hard and have to treat ourselves every once and a while too! If you're struggling coming up with ideas for yourself this Christmas, take a look at some of these must have options! I chose a combination of things that I am asking for this year, as well as some of my personal favorite items that I think you must get! 1. Tory Burch Tote- This tote is absolutely adorable! What a great neutral bag that will go with just about anything. This one is definitely on my wish list this year! 2. Over the Knee Boots- I cannot get over how amazing these boots are! I'm sure you've seen these on bloggers all over the country, but they are truly that wonderful! I bought these pretty recently and they make an otherwise okay outfit, look totally trendy! This retailer has some amazing sweater options as well, be sure to check them out! 3. Camera- I have had this one on my list for quite some time now. Not only do I want to learn to take high-quality and beautiful photographs, but it wouldn't hurt this whole blog experience either ;) Even bigger plus, it's on sale and marked down 40%! That's a huge steal! 4. Kendra Scott Necklace- This has been one of my favorite purchases of 2017. This is my everyday, go-to necklace that gets complimented daily. You can layer it with many other necklaces for a more trendy look, or wear it alone as a more sophisticated and simple option. There are so many colors to pick from, so you can get one for yourself, and some of your favorite women in your life! Your mom, sister, and friends will love this sweet necklace! 5. Booties- These are my number one purchase from this year. Every time I wear them I tell my husband how great of a purchase they were. They're super comfortable and look better the more that they get worn. The leather is such a beautiful color and they look so great with so many outfits. Be sure to size up in these though. I normally wear and 8.5 and the 9's fit perfectly. Plus, they just came out with a new color and I'm dying to buy them. 6. Diffuser- I've been looking for a cute and affordable diffuser for the house, and recently found this adorable one. Aromatherapy can be such a good investment for your beauty, health and not to mention the scents are to die for. This is on my wish list this year! 7. Curling Wand- I've been curling my hair for a while now with just a cheap one from Ulta, but it's just not cutting it anymore. I went on a mission to find a wand that wasn't too damaging on my hair and that could fit a variety of my needs. I found this one and it's PERFECT! With interchangeable barrels, I can curl my hair in so many ways. No need for cluttered cabinets with this versatile tool! 8. Roomba- I know what you're thinking...a vacuum for Christmas? With three pets and a messy husband, I get so sick of vacuuming our floors every week. Who has time for that? This vacuum can be set to various times and all you have to do is click one button to set him off. It can be controlled from your phone, which is wonderful with a busy lifestyle. When the little guy is done, or his battery runs low, he makes his way back to his docking station to recharge. How much easier can this make your life? I plan on finding out! 9. Dress- I'm including this dress because you must get it ASAP. This dress is so incredibly flattering on many different body types. It comes in 5 great colors and can be paired with a trendy leather jacket or a more simple scarf. My go to is this dress paired with the over the knee booties above! 10. Tory Burch Watch- This watch is sooooo cute! I think watches are investment pieces that can be worn over such long periods of time. They don't seem to go in and out of style and dress up outfits so well. Be sure to add this gorgeous watch to your Christmas list this year! Those are my recommendations for your Christmas wish list this year! I'll be adding other gift guides even few days, so be sure to come back and check those out! You can never have too many recommendations of gifts this season!